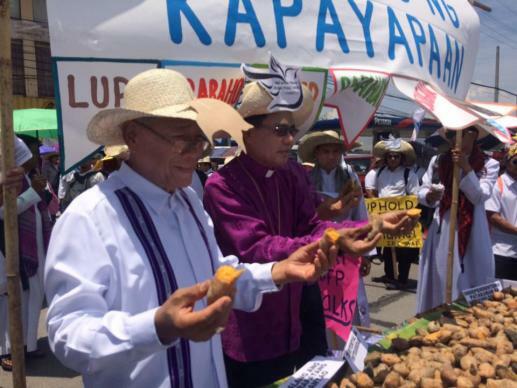 Hundreds of people from all walks of life held peaceful rallies before and during the first State of the Nation Address July 25 by President Rodrigo R. Duterte of the Philippines.Three United Methodist bishops — Bishop Rodolfo A. Juan, Manila area; Bishop Ciriaco Q. Francisco, Davao area, and Retired Bishop Solito K. Toquero — led an ecumenical prayer and communion service during the rallies.Other church members and seminarians from Union Theological Seminary, the Aglipay Central Theological Seminary and Saint Andrew’s Theological Seminary took part, along with members of Kasimbayan and the Promotion of Church People’s Response.Juan said that this State of the Nation Address has been the most peaceful he had witnessed. “There were no barricades. The police were just standing and unarmed,” he explained. “His (Duterte’s) emphasis on no separation between God and state is commendable; he really has a sense of religiosity and spirituality,” the bishop noted. New president’s State of the Nation Address inspires hope in many. It’s not enough to go to church, or be religious. You need to be “saved.” Are you saved? How do you know when you are saved? Today’s sermon will guide your heart to the answers of your questions and a life life everlasting in Jesus Christ. If the spirit has warmed your heart to give a small amount of money to help this church spread the word of God, please click here to securely give now. Thank you and may God bless you. Are you Saved? What do we mean by this question? Can we really know that we are saved? What will happen if we are not saved? This sermon is based on the conversation of the rich young ruler with Jesus in Mark 10:17-27. Sunday service begins at 10:15 a.m. sharp. Bring friends and family. Now is an excellent time to invite folks who are just curious to see what the new pastor is about.